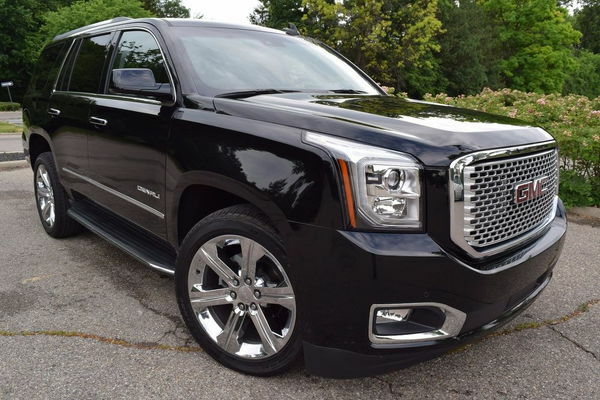 2016 GMC YUKON DENALI-EDITION. Loaded with options. SUPER LOW ,EASY & PAMPERED miles. THE ONE/THE ONLY WORKHORSE 6.2 Liter V8 naturally aspirated engine/SUPER ENGINE WITH SUPER POWER. Smooth Shifting automatic transmission for maximum performance and added power. RARE/IMPOSSIBLE TO FIND A DENALI PACKAGE IN A YUKON WITH EVERY POSSIBLE OPTION. RARE HUD / HEAD UP DISPLAY. Lots and lots of power from this engine. FACTORY DVD PLAYER. POWER OPERATED SUNROOF WITH SHADE OPTION. COLORED NAVIGATION SYSTEM with pinpoint map accuracy directions for go anywhere driving. BLIS SIDE MIRRORS / BLIND SPOT ALERT SIDE MIRRORS. BOSE AUDIO SYSTEM. ADJUSTABLE PEDALS. CD PLAYER. Sirius/XM satellite radio. ON STAR. DUAL power HEATED & COOLED front leather seats with lumber adjustment for both passenger and driver. MID ROW CAPTAIN CHAIRS. MID ROW HEATED SEATS AS WELL. POWER FOLD THIRD ROW SEATING. BLIS SYSTEM/BLIND SPOT ALERT SYSTEM. POWER FOLDING SIDE MIRRORS. HEATED SIDE MIRRORS. DUAL POWER SIDE MIRRORS mirrors. DRIVER SIDE MEMORY SEAT. POWER REAR TAILGATE. ROOF RACK. 3rd row seating. PUSH BUTTON START ON/OFF. COMES WITH 2 FACTORY KEYS / 2 FOBS. FACTORY REMOTE START. ELECTRONIC REAR TOW PACKAGE. FRONT PARKING ALERT SENSORS. REAR PARK ASSIST SENSORS. LANE CHANGE ALERT SYSTEM. COLLISION ALERT SYSTEM/VIBRATING SEATS(ALERT). DUAL SIDE running boards. PARK-ASSIST(REAR SENSORS FOR ALERT). ON STAR on demand. Rear back up sensors (alerts you when backing up to an object). REAR VIEW CAMERA. HOME LINK/GARAGE OPENER. XENON HEADLIGHTS. 4GLE WIRELESS CONNECTION. MID CONSOLE CHARGING/DOCKING TOP(ARM REST). Dual zone/FRONT automatic climate control. 22" PREMIUM/FACTORY CHROME FACED WHEELS with all SEASON EXCELLENT 22" tires. Tire pressure monitoring system ( alerts you when one of your tires is low on air). LEATHER WRAPPED STEERING WHEEL. HEATED STEERING WHEEL. POWER TELESCOPING STEERING WHEEL. STEERING WHEEL CONTROLS. 120V POWER OUTLETS. REAR TOWING PACKAGE. FOG LIGHTS. ON STAR. Bluetooth connectivity. Vehicle anti-theft....AND MUCH MORE . EXTREMELY smooth and powerful ride!